A bright sculpture is a statement piece in any garden. It can serve as a focal point and even a conversation piece for your upcoming summer parties. It doesn’t have to be commissioned artwork either. Any funky piece of furniture in a bold hue will work just fine! Recycled glass comes in a multitude of colours and can match your existing theme. You’d be helping out nature as well when you opt for this colourful gabion stone alternative. 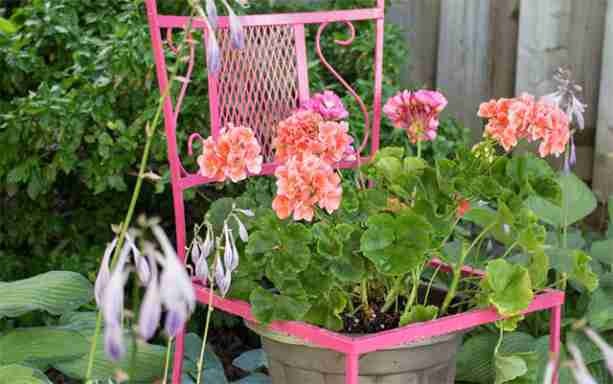 An old lawn chair can be easily transformed into a show stopper when painted in a shocking colour. You can also opt for powder coating if wanting to transform metal furniture. Simply search for powder coating and your Town’s name online to find people who can do this for you in your area. Accent walls are not meant to recede in the background, so dare to go bold with yours! Most people do not think they do have a spare wall to do this but you can easily apply this trick to a retaining wall, a fence, or any area that can benefit from a big splash of colour. Some neighbourhoods have a certain colour palette that you have to adhere to, but most do not care what paint you use for your shed, garage, studio, or playhouse. If you have an outbuilding in your backyard, then that’s your opportunity for colour freedom on a smaller scale. After all, a rainbow-painted home can seem too outlandish but no one will bat an eyelash if you paint a shed in zebra stripes. There is no rule saying that you can only use tiles in wet areas or in the pool, you can certainly use tiles anywhere you want to create some beautiful geometric patterns or anywhere you want to add some interesting details to. You can also use vivid-hued tiles in your pool surround. You can add colour to your garden without having to go big. You can choose to add small glass spikes, a few colourful planters, or maybe just a bright outdoor rug. The trick is to keep everything balanced while still injecting a dramatic hue into your colour palette. Sometimes the best colour addition you can use is from plants. Research what brightly-hued flowers fit well with your garden and head on to a nearby nursery to get them. Some perennials have very exotic looking blooms and will give you flowers for a few years to come. In-love with festive colours and beautiful gardens? A home in Oakville might fit just right for you! With plenty of greenspace and parks, there’s no wonder homes in Oakville’s neighbourhood’s are sought-after in Toronto. Contact us for a viewing!